Inside A #StyleBlogger’s Closet: My New, Affordable Summer Favorites! I’ve been off the grid, but now Style Darling is back with plenty of affordable & stylish summer finds that I know I was pretty psyched to add to my wardrobe. Always with a budget in mind, I came across some summer must-haves, including maxi dresses, footwear (sandals & flats), totes, & jewelry. Also, when it comes to making seasonal investments, I seek out pieces that I can get as much wear from, transitioning pieces (especially accessories) from season to season. This summer, I’m not only planning a Hamptons getaway, but I’m also hard at work & making plenty of time for social calls, which makes me want to amp up my staples for more than one occasion. The following buys are the newest additions to my wardrobe, & I hope they’ll inspire my readers as well! 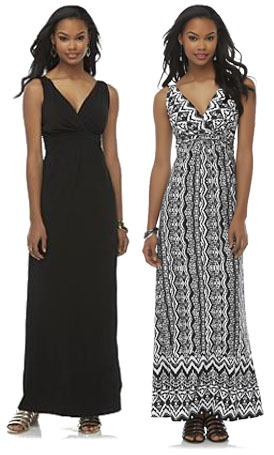 SHOP: Covington maxi dress ($24.00) in black @Sears & Covington maxi dress ($24.00) in tribal @Sears. 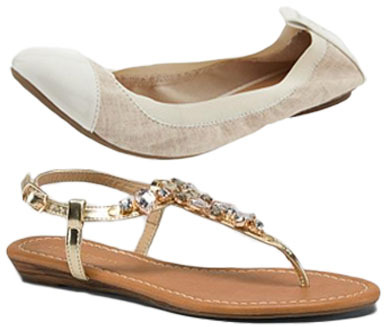 SHOP: Libby jeweled sandal ($24.99) in gold @Dress Barn & linen blend scrunch flats ($22.94) off white @Old Navy. 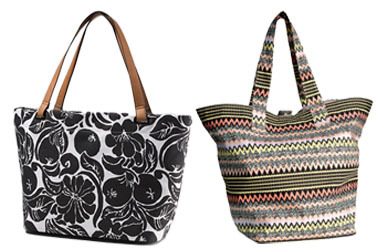 SHOP: floral handbag ($25.20) in black & white @Dress Barn & patterned shopper ($9.95) @H&M. 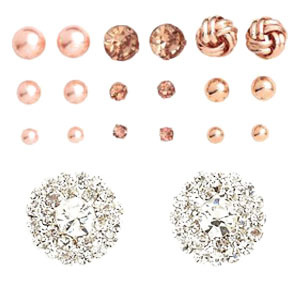 SHOP: earrings set ($9.95) in rose gold @H&M & rhinestone button stud earrings ($6.00 / 2 for $10.00) in silver @Charlotte Russe. What are your favorite summer buys? What stores are you shopping for the latest trends this season? For more stylish posts, check out summer celebrity style featuring Olivia Palermo & Victoria Beckham, Charlize Theron’s Forever 21 jumpsuit look, the complete red carpet gallery of this year’s Met Ball including Rihanna & Beyoncé, & Top 10 Celeb Sightings with Iggy Azalea & Taylor Swift. Happy Styling! This entry was posted in Accessories Access, Basics for a Bargain, Inside A Style Blogger's Closet, Luxury Look-Alikes For Less, NYC Street Style, Quickie Darling Deal & Steal, Show Me The Shoes, Style Darling Daily, The Stylish Five and tagged Accessories Access, affordable fashion, Basics for a Bargain, Charlotte Russe, Covington, Dress Barn, fashion, H&M, Inside A Style Blogger's Closet, jewelry, Luxury Look-Alikes for Less, NYC Street Style, Old Navy, Quickie Darling Deal & Steal, Sears, Show Me The Shoes, street style, style, Style Darling Daily, style for days. Bookmark the permalink. ← Top 10 Celeb Sightings: Color Combinations & Easy Elegance for Summer, Featuring Victoria Beckham, Solange, Olivia Palermo, & More!